As Halloween approaches, your children or grandchildren might be anxious about confronting witches and werewolves while trick-or-treating. But, there are more real and consequential dangers lurking in the shadows. Luckily, you don’t need a silver bullet or a stake to ward them off. Here are some steps that you can take to avoid danger and damage to your home and property this All Hallows’ Eve, as well as a guide to what your insurance will likely cover, should something frightful occur. 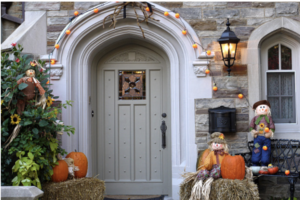 Here are some steps that you can take to avoid danger and damage to your home and property this All Hallows’ Eve, as well as a guide to what your insurance will likely cover, should something frightful occur. Don’t let little ones carve their own pumpkin. Instead, have them remove the pulp (both disgusting and fun) and draw their design or pattern on the pumpkin for you to carve for them. Remember that adolescents still need supervision. Just because their hands are bigger, doesn’t mean the knives are any less dangerous. Purchase a pumpkin carving kit so that you have the right equipment. A chef’s knife, a bread knife, even a paring knife are the wrong tools for the job. Even when you’re extra careful, accidents can happen. Make sure you know how to handle basic injuries and the proper way to clean a wound and apply a bandage. Carelessness and open fire account for 13 percent of all Halloween fires. Many of these can be avoided by taking simple precautions. Avoid placing lit candles in carved pumpkins. Halloween costumes and decorations can catch fire easily, so opt for battery-operated candles and tea lights instead. If you insist on using real candles, never leave them unattended. Be sure to test your home’s smoke alarms in advance of your celebrations, and make sure you have fire extinguishers on hand—and that you know how to use them. Decorate your costume with reflective tape so that cars and other pedestrians can see you. Incorporate glow sticks into your outfit so that you’re even more noticeable. Wear face paint instead of masks to avoid obscuring your vision. If children will be visiting your home, you’ll want to make it safe, inviting and enjoyable for them. For many children, this is a night that they look forward to, so do your part to help make sure it doesn’t end in tears. Move all lawn hazards, such as your garden gnome or hose, closer to the bushes or indoors. Turn on your porch light and use outdoor lighting to illuminate your walkway, especially if it’s cracked in places. Move your porch decorations out of the way. Your collection of festive gourds may look great, but they won’t be so attractive if they’re trampled by a candy-crazed herd of youngsters. Keep pets secured in another room. Frequent use of the doorbell and masked guests can make dogs feel anxious or stressed. Stressed pets might nip, scratch or bite anyone who approaches them. Creating a haunted house is the perfect way to bring Halloween to life for your family and friends. However, having your guests traverse dimly-lit rooms, where unknown beings may jump out or fly in front of them, can easily turn light-hearted fun into a horror story. Make sure all entryways, hallways, stairways and pathways are clear. Use tap lights or electric candles to light the floor so that your guests can see where their feet are headed. Affix decorations securely to the wall. Stay home and turn on your indoor and outdoor lights. If it’s a nice night, sit on your porch and hand out candy from there. And make sure it’s a good treat to avoid retribution. Nobody wants a cucumber in their bag. Don’t turn off all your lights, even if you’re tempted to do so to ward off trick-or-treaters. Place your car in your garage. If you don’t have one, stay home and keep your driveway well lit. If a candle is left unattended and a fire starts, your dwelling, its contents and other unattached structures on your property are likely insured for damage and loss of use due to a fire. But, as mentioned above, skip the candles to try to avoid calamity altogether. There are a surprising number of items that get thrown on Halloween. Eggs, pumpkins, even candy that trick-or-treaters are displeased with. If the glass in the windows or doors around your home is damaged, the dwelling portion of your insurance will likely cover the repairs. Any damage to your car caused by malicious mischief or vandalism would be covered by the vehicle’s comprehensive (or non-collision) coverage. This means that if someone hurls eggs at your car, and you don’t discover it until the next day, your insurance will likely cover your new paint job if that’s in order. Similarly, if someone drops a pumpkin onto your car, breaking the windshield or denting the hood, that damage will probably be covered.